Install too many applications on your iPad and hard to manage? 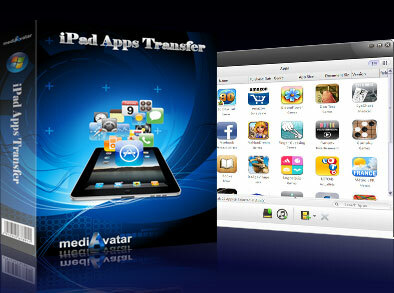 MediAvatar iPad Apps Transfer could be the right software for you to manage your apps on your iPad. MediAvatar iPad Apps Transfer enables you to transfer apps between iPad and computer, it also supports transferring apps from iPad to iTunes, backing up iPad apps to PC, deleting apps on your iPad or moving the apps back to iPad as the perfect iPad apps management software. 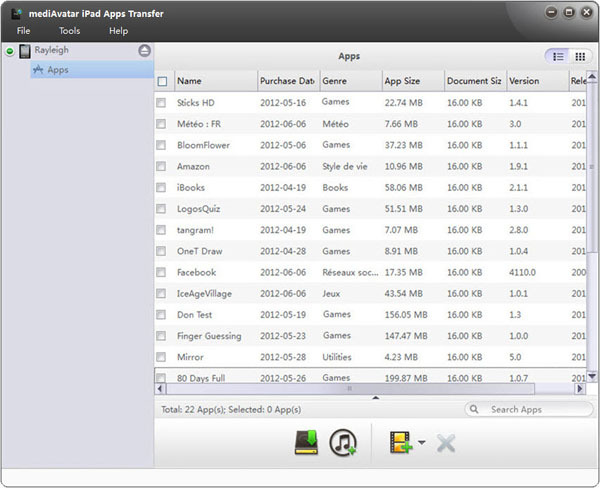 With MediAvatar iPad Apps Transfer, you can also add, save and delete the app documents for iPad apps. Copy apps from iPad to your PC or iTunes for backup, also support transferring apps back to iPad, deleting apps within this software. With MediAvatar iPad Apps Transfer, you can easily add app documents from PC to iPad, save app documents to computer for backup or delete app documents from iPad directly. When your iPad is connected to the computer, all the apps on it will be showed up automatically. Easy to locate the app you need with MediAvatar iPad Apps Transfer, you only need to input the name of the app, and it will appear in front of you. The app documents will be showed up with Name, Modified time and Size after you choose an app. Support iPad Wi-Fi, iPad Wi-Fi+3G, iPad 16GB, iPad 32GB, iPad 64GB, ipad 2, the new iPad, iPad 4, iPad mini, iPhone 5.